Our beautiful 4 bedroom 2 bathroom villa, which consists of over 2,000 sq. 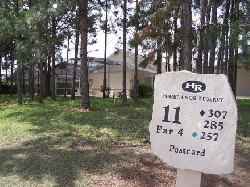 feet of living space, is located on the prestigious Highlands Reserve Golf and Country Club only 10-15 minutes from Disneyworld. The villa itself is located in a quiet residential area with the pool and spa area offering stunning views over the golf course without being overlooked. 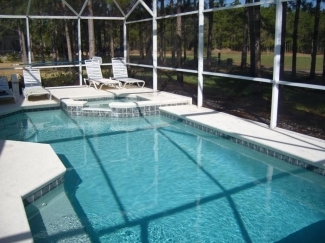 It is the most ideal place for a relaxing holiday while at the same time offering easy access to all of Florida�s many attractions as well as the superb championship golf course at Highlands Reserve. Local restaurants and shops are within easy distance. Many of our guests have said that our villa is one of the nicest, cleanest and best equipped villas they have stayed in. Games room with 7.5ft air hockey table, 8 ft pool table, table football and electronic dartboard. The villa has two bedrooms on either side of the main bathroom. 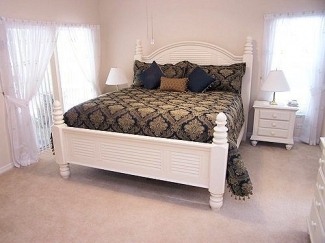 This gives the feeling of two separate sleeping areas which is ideal for when two families are sharing. However, the main bathroom has two doors giving easy access from any of the four bedrooms. The main living areas and bedrooms have luxurious carpeting and the rest of the house has cream floor tiles giving the house a cosy, yet contemporary feel. The living areas have air-conditioning while all of the bedrooms have fans. The family room has large patio doors leading out to the pool area. These doors are alarmed with a beeper therefore letting you know if your child has gone out to the pool area. The room has a large cable TV, DVD player, CD/Radio/Cassette stereo, Wii, Sony Playstation 2 with two controllers and games, board games and books etc. to keep everyone amused. The room is furnished with two new extremely comfortable sofas, side tables and lamps and with a unit for the TV and other electrical items plus a central coffee table. Behind the sofas is a breakfast area. This consists of a table with seating for four people and also two bar stools at the breakfast bar. Located in the family room you will find the guest information book. Here we have included lots of driving instructions on how to get to the main attractions in the area, supermarkets, shopping malls and restaurants. We have also included sample menus for the restaurants plus all the information you will need to make your holiday a happy one as well as finding your way around easy. The kitchen units are beech. 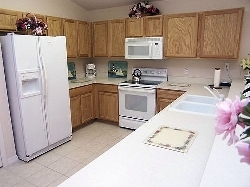 As the home is relatively new to the rental market the units and equipment are like new. The kitchen has an electric cooker with ceramic hob and a built in microwave above it. There is a huge American fridge-freezer with ice dispenser, coffee machine, toaster, kettle plus all the equipment you would need. There is a large range of quality tableware as well as a complete set of picnic type plates, cups, glasses etc. which can be used around the pool area thus enabling those alfresco meal times. 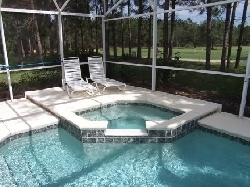 The pool/spa area has a sunny deck and the pool has shallow steps going into it allowing easy access. It also has a separate spa (jacuzzi style) area with a waterfall feature. There is a covered porch and comfortable pool furniture. The porch has an overhead fan and a light so this is an ideal place to sit and admire the stunning view with a cool drink when you need some shade. At the other end of the pool area you will find a table and chairs which is perfect for dining in the sun. If you want to do some serious sun worshipping there are numerous sun-loungers. The charcoal grill style BBQ is located just outside the pool area. Through an archway from the kitchen you will find the separate living/dining room. 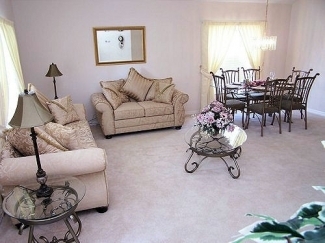 This is a beautiful room with two lovely sofas and is great for when you want some quiet time. The modem and router are also located here, so if your laptop does not have WiFi then you can plug directly into the router and surf the net. Also in this room is a beautiful glass topped dining table with ornate metalwork on the table and chairs. This table seats six comfortably and has an overhead dimmable chandelier style light. The laundry room has an American top loading washing machine which gets the washing done in super fast time. It also has a large tumble dryer, iron and ironing board. This means you can keep things clean and fresh in no time at all and you can bring fewer clothes with you so you have space left to take home all the wonderful bargains to be had in Florida. The easy to use alarm system is situated in the laundry room. This is a very large room with a huge new king size bed. 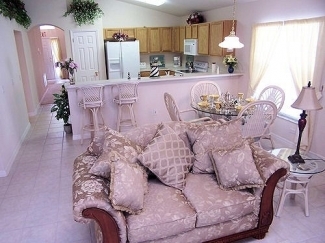 It has alarmed patio doors leading out to the pool area and is furnished with white Floridian style furniture. It has an en-suite bathroom leading off of the bedroom. This has a large walk in shower, a bath and a separate toilet. The cabinets are beech with a cream marble top and his and hers basins. It has mirrors along two of the walls allowing you to be able to see the back of your hair when styling it. There are power points by the sink and a hairdryer is supplied. 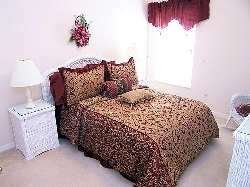 There is also a large walk-in closet off the master bedroom with a floor safe for your use free of charge. This has a double size bed, fitted wardrobes, ceiling fan and cable TV. All the bedding is new and of a luxurious quality. This also has a double size bed, fitted wardrobes, ceiling fan and cable TV. The bedding is new and of a luxurious quality. This has two single beds, fitted wardrobes, ceiling fan and cable TV. 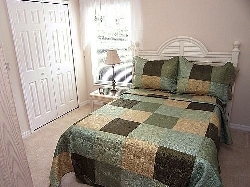 It also has new bedding of a luxurious quality. We have a very large games room which has a 8 ft pool table, 7.5 ft air hockey table which has electronic scoreboards, 3 game settings and cup holders. It has the capacity for four players to play at the same time. The room has a settee for spectators to sit and watch the action and fans for the when the action gets a bit too hot. We also have a table football and dartboard. This is a Jack & Jill bathroom with beech cabinets, cream marble counter tops, mirrors all along one wall and his and her sinks. It has a toilet, bath with a shower over it and a hairdryer for your use. Our villa is maintained by an excellent local management company who are very friendly and efficient and offer a 24 hour support service 7 days a week.